The positive healthy benefits are great, but the most important part is that they taste awesome! The flavors are so real. The Mojito Lime Mint tastes just like a mojito, and the Spearmint is sweet, refreshing, and delightful. I also like that each pack of mints is in a convenient resealable pouch so I can easily throw it into my purse or pocket. 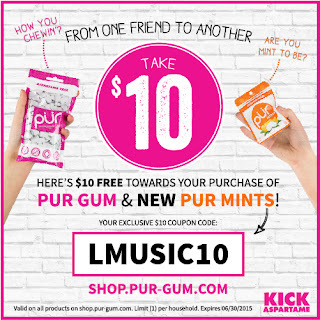 If you want to get some PUR Mints for yourself, you can order some now with this $10 off coupon, but hurry, the coupon is only good in the month of June! PUR Mints sent me free mints to try for this review and I'm glad they did because my family and I really enjoyed them. All opinions expressed are my own. No other compensation was received.